Yes that's true. But my point was that they don't live somewhere, where is is cold the year round. Not to say that the idea that Karigor is one with Jadame isn't fine for me. It is. a) I doubt it is that easy to contact him. b (and most importantly)) people should realize that as much as we love mm setting, it never was concrete setting that is fully though beforehand. Basically each new part just adds content it needs. MM setting certainly wasn't created as forgotten realms or greyhawk where you have rather fat book after which adventures are created not the other way around. Was there any idea of Jadame once they were creating Erathia for mm7/homm3? I heavily doubt it. Also what possibility is to discuss where canon wise Karrigor is located if it is mentioned, on grand total of few items. It's just a name at this point. Anything else that even remotely tries to flesh out Karigor or any other such place is pure Fan fiction that is not canon and thus for does not need any confirmation from developers, nor can be subject to serious argument. tress wrote: Also what possibility is to discuss where canon wise Karrigor is located if it is mentioned, on grand total of few items. MM6 Negotiator wrote: If ever there was a snake's nest of politics and religion, it was Karigor. Karigor is a small island southeast of the 'bootleg' that New Sorpigal is situated on. The twin rival Churches of the Sun and the Moon were founded there, and fought the longest war the world has ever seen until they managed to destroy one another about 200 years ago. Their artifacts of power are scattered around the world. MM6 Miller wrote: Grindstones are so hard to make and find, it's a wonder anyone ever becomes a miller. I hear that Karigor has a great rock quarry that turns things like millstones out by the hundreds. MM6 Stonecutter wrote: They say that the streets of Kalimar, the capitol city of Karigor, are made of fine jade, and the buildings all use it too. Sounds beautiful, doesn't it? MM6 Hunter wrote: Mogreds are extinct in Enroth, and almost extinct in Karigor. They were over-hunted because of how valuable their horns are for enchanting. MM6 Scribe wrote: When I was much younger, I had a chance to see the ruined library of the Church of the Moon at Karigor. It was made entirely of jade and marble, and once contained the wisdom of the ages within its hallowed halls. If ever you have a chance to visit, take it! A city of jade should be interesting in MMT! Well it is bit y more than I expected(had really lousy version of mm6 when i first played it and haven't had good opportunity to replay it seriously). Still It is just handful of names, and vague outline of concept. Not really have feeling that each scrap of text should be treated as if it was fundament of highly thought concept. Ye could be interesting. Until now almost all towns in mm universe were generic fantasy towns. BTW is there any updates on MMT? While they were hugely optimistic thoughts, they suggested to get some new demo by now. I understand it is huge job to create game but still. tress wrote: Well it is bit y more than I expected(had really lousy version of mm6 when i first played it and haven't had good opportunity to replay it seriously). Still It is just handful of names, and vague outline of concept. Not really have feeling that each scrap of text should be treated as if it was fundament of highly thought concept. It probably wasn't well thought out indeed. But in-game, it was real. So any canonical information helps. As for anything regarding that being fan fiction... Well, to be fair, any interpretation is already fan fiction. Saying that the Gates to Another World is part of the Gate Web is fan fiction. Saying that the Gates to Another World are not part of the Gate Web is also fan fiction. But that's what makes it fun to discuss things like that. But yes, asking the developers is hardly helpful - for each question answered, three more will inevitably arise... The more you know, the more you realise that you don't know anything about it. They surely are working their best. MMX has been saying for months that we were getting started on our first town, and we still are. This time is definite, though. We have enough staff ready and concept artists are making drawings before the modelers and level designers start building. It's a slow process so I can understand why MMT has no regular updates. Anyway, what was the original topic of this thread? A map? If even one person is not doing it, then not everyone and there are more then one person, who don't have Failbook account and is not going to create it. GreatEmerald wrote: Anyway, what was the original topic of this thread? A map? Yes, "recreating" map of Enroth planet. It's Enroth - it was never named Colony in any games or NWC texts/interviews. Enroth as planet name was first used in MM8, earlier it was just nameless world. Maybe if MMIX has happened on Enroth and showed us conclusion of Ancients-Kreegan story (as MM8 ending hinted), planet name would be different and more creative, but this didn't happen and in MMIX we got new story, not tied to previous plots (besides few hints here and there). Just something I wanted to ask. Are you sure the land is called Eeofol and not "Land of the Giants"
I thought only the tunnels were named Eeofol, as in "The Tunnels of Eeofol"
Avonu wrote: Enroth as planet name was first used in MM8, earlier it was just nameless world. 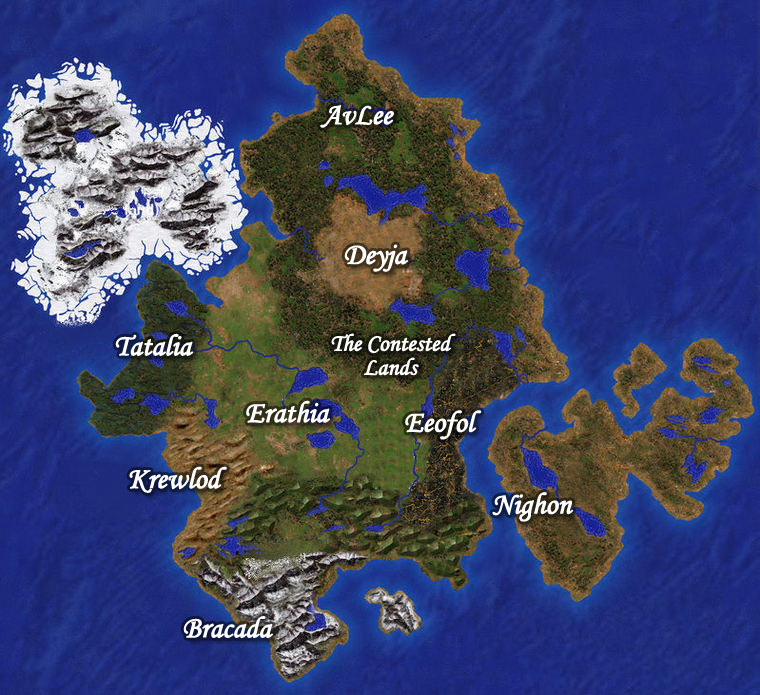 The manual of the game repeatedly refers to the planet as "world of Enroth", and Melian introduces himself as "Guardian of Enroth". MM8 uses Enroth as the name of the planet even more extensively. Avonu wrote: It's Enroth - it was never named Colony in any games or NWC texts/interviews. Enroth as planet name was first used in MM8, earlier it was just nameless world. Well everyone knows that Colony is just a word that is commonly used for the planet Enroth to distinguish it from the continent Enroth on the said planet. But realistically just how much does it matter what the planet's called, it's just called the world to it's inhabitants which is after-all what people are generally concerned with. Enroth to them refers to a continent. Slayer of Cliffracers wrote: Well everyone knows that Colony is just a word that is commonly used for the planet Enroth to distinguish it from the continent Enroth on the said planet. It isn't. If you disagree, then find a single instance of "Colony" (with a capital "c") being used as a name of the planet. You won't be able to. Moreso, even just "colony" isn't ever used by natives as name for the world they live on. Slayer of Cliffracers wrote: Enroth to them refers to a continent. And to the planet. It has been repeatedly called Enroth by its inhabitants in the games. Three of them in this case - Melian, Sandro and Xanthor. Also, Klavis Verge - even though he's out-of-universe and doesn't count as a proper lore character, but the introduction in MM6 manual refers to the planet as "world of Enroth" more than once. XEL II wrote: It isn't. If you disagree, then find a single instance of "Colony" (with a capital "c") being used as a name of the planet. You won't be able to. Moreso, even just "colony" isn't ever used by natives as name for the world they live on. XEL II wrote: And to the planet. It has been repeatedly called Enroth by its inhabitants in the games. Three of them in this case - Melian, Sandro and Xanthor. Also, Klavis Verge - even though he's out-of-universe and doesn't count as a proper lore character, but the introduction in MM6 manual refers to the planet as "world of Enroth" more than once. I am not arguing that the name Colony is a canonical term for planet Enroth ONLY that it is a useful out-of-universe code-phrase to distinguish planet-Enroth from continent-Enroth. I know that there are in game references to it being Enroth (else this problem would not have arisen), but most of the time when people use the word Enroth in the games they are referring to the continent. Thus we generally are justified by using the non-canonical name for the planet rather than the continent. And I would generally suspect that if you said Enroth to a person on the street they would assume you meant the continent. The people you mentioned are aware of 'what's behind the curtain' hence they know that Enroth is the name of the planet they happen to be standing on.